MRC Africa provides a FREE 2D Thermal Simulation of existing and new build roof systems as part of our commitment to thermal excellence. 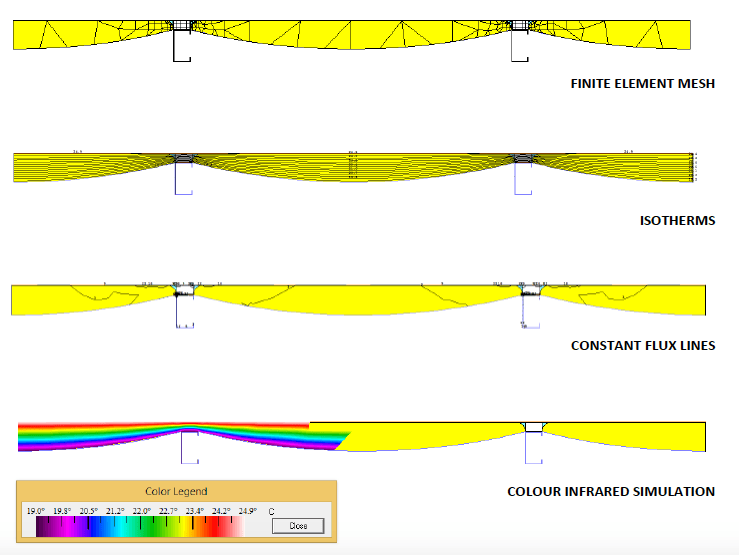 Our reports use one of the top internationally recognised thermal modelling software, allowing us to model the complicated geometries of building systems with the ability to accurately calculate total R-Values of assemblies. Single skin metal roof sheeting. Partially compressed insulation roof systems complete with packers. Uncompressed insulation built up roof systems. All of the above can be installed with a range of differing metal roof sheeting profiles, yet each system has dramatic differences in thermal and acoustic performance. The simulation software will show all the different system performance and show the dramatic impact that compressed insulation has on the thermal performance of the roof system. So far we have seen dramatic loss of assumed and stated thermal performance even up to over 70% on an industry standard construction. The importance of such simulations cannot be understated as the clients long thermal thermal performance is at risk. You may be alarmed at the real thermal performance of your potential or actual roof system!